Why Aren’t My Hens Laying Yet? One of the most common reasons, particularly in late fall or winter, has to do with light. Most chickens are very sensitive to the amount of light they get and need 14 hours of light in order for the egg laying hormones to be activated. It does vary some by breed, but 14 hours is a pretty good target. As a point of reference, on January 25th on our farm, we’re getting not quite 11 1/2 hours of light that’s bright enough to make a difference. That’ll increase a little each day up through mid-June, when we’ll be getting about 15 hours. Recently this winter, we’ve been moving breeding flocks from the barn out the the field. In the barn, the birds get artificial light starting at 6 am, when I got out to the barn to begin feeding, and the lights go off around 8-9pm. While one of our flocks, the New Hampshires, was in the barn, they were laying about about a 70% rate, that is, I was getting about 7 eggs from 10 hens each day. But now that they’re out in the field, with no artificial light, I might be getting one egg a day. And that’ll improve as spring approaches. If you choose to add light, first add 30 minutes of light in the morning. After a week, change to 1 hour of light, and so on, adding 30 minutes each week until you get to 14 hours of light. Often just adding light will cause them to start laying soon, particularly with new hens that you’ve raised up to 6-7 months of age. For some other ideas that may help, see: Why are my chickens not laying eggs? Why are my chickens not laying eggs? Amount of daylight — hens need 14-16 hours of daylight each day to lay their best. In the late fall and winter, the shorter number of daylight hours is one of the most common reasons that your hens may slow or stop their laying. We don’t typically do this because it disrupts the hens natural laying and rest cycle, but if you want to supplement their light to increase laying, you can set up a light to come on a few hours before the sun rises. Water — chickens should always have good access to clean water. If they run low on water, this can cause stress and reduce laying. Quality layer feed — Hens need a good balance of carbohydrates, protein, vitamins and minerals to lay well. A good quality layer feed with contain the proper balance. If you’ve been feeding your chickens a lot of table scraps or scratch grain, that can throw off the balance and reduce their laying, so use moderation. Stress — Stress will cause your hens to lay less. Molting — When your chickens are molting, they’ll lay less or stop laying. This usually happens about once a year. 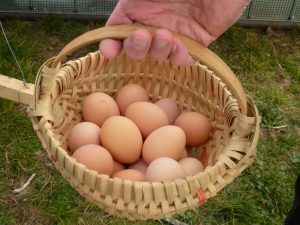 Age — Most hens will lay well for the first two years, then their egg production will gradually decline up through about year five. To have an ongoing supply of eggs, you’ll need to add new hens periodically. Snakes and Skunks — These can eat the eggs that you are getting. Check your coops more frequently and look for signs that you might be losing eggs to predators. Diseases or Parasites — A hen that isn’t healthy or that’s suffering from parasites may lay less. How can I get my hens to start laying in their nest boxes? Since hens tend to look for a dark place to lay their eggs, position your nest boxes on the darkest wall of your chicken coop. Try to avoid having light from your chicken coop’s window or door shining directly into the nesting box. Place a few wooden or ceramic eggs in the nesting boxes. When your hens see these, they will start to view the nesting boxes as an appropriate place to lay eggs. It’s best to have nest boxes available in the coop by the time your hens turn about 16 weeks old. That way, they will have plenty of time to explore and get used to the nest boxes and will be more likely to use then once they’ve started to lay. If you weren’t able to get nest boxes in time for them to get trained to the nest boxes, you may still be able to get them to lay in the nest boxes mounted in your coop by training them very gradually, like I’ve done with one of our laying flocks. First, place a nest box in a dark corner on the floor of the coop, with plenty of bedding in it. Put a few ceramic nest eggs in it. After a few days, if your hens have started laying in this nest box instead of on the floor, then raise this nest box an inch or two every few days. Over the course of a few weeks, if you can get your nest box up to the height of your built-in nest boxes, and if the hens are still laying in it rather than on the floor, you can place it right next to your main nest boxes for a week or so. Next, move the ceramic nest eggs out into the adjacent built-in nest boxes. If all is still going well, then after a few days, remove the standalone nest box, and your hens will hopefully now be laying only in your built-in nest boxes. How to wash chicken eggs? The best way to get clean eggs is to avoid letting them get dirty in the first place. But there are times when that’s not always possible. To get clean eggs to start with, keep fresh bedding in the nest boxes, and plenty of it. Remove soiled bedding as soon as you notice it. Dirty bedding leads to dirty eggs. The coop floor affects how clean the eggs will be. If the floor of the coop has lots of wet manure on it or mud, the hens will track that into the nest boxes, making the bedding and eggs dirty. If it’s a mobile coop, move it to fresh ground regularly. If it’s a stationary coop, keep fresh bedding on the floor, or better yet, use a deep bedding system. You can buy various egg washing equipment and cleaners, but for small scale egg washing, all you need is some sandpaper, a sponge, warm water and some unscented dish soap. If the egg isn’t too dirty, use a bit of sandpaper to sand off the dirt. This avoids removing the bloom, or cuticle — a protective surface that naturally protects and preserves the contents of the egg. Water washes off the bloom as well as the filth, so if you wash the egg, you’ll need to refrigerate it afterward. To wash it, use water that’s warmer than the egg. Warm water will heat the egg slightly, causing a little pressure from within. Cold water does the opposite, creating a little suction that can draw dirty water and bacteria through the pores of the eggshell into the egg, so only use warm water (water that’s a bit warmer than the egg). For more information, see our article on how to clean chicken eggs. What is a trap nest? A trap nest is a nest box that has a door which automatically closes when the hen enters it to lay an egg. There are a number of different designs for the automatic doors that involve different (sometimes quite ingenious) trigger systems, usually mechanical. Trapnests have a couple of uses. For one, it lets you know which hens are laying eggs. This lets you determine accurate which hens are your best layers. (There are other approaches that work, too, but they are a little more subjective). Second, it lets you know which hen laid which egg. This can be useful in breeding programs. For example, suppose you have a flock of hens that you are pen mating with one rooster. If you have trap nests, not only will you know the sire that fertilized the eggs, but you’ll also know the hen that it came from. We’re not currently using trap nests with our flocks but have considered it and may in the future on a limited scale. The main limitation or downside with a trap nest is that you have to check them frequently to let the hen back out after she’s finished laying. When do chickens start laying eggs? The short answer is that most of our breeds will start to lay at around 5 to 7 months. For example, our Black Australorps layed their first egg when they were 26 weeks old (6 months) and were laying very well by 7 to 7 1/2 months. Though you can buy hybrid layers from various sources that will start laying earlier than that, some as early as 4 1/2 months, early laying is not one of the traits that we select for. I’ll explain why. It’s important to realize that as soon as your hen starts to lay, she will cease to grow. So, if she starts to lay at a very young age, she will not get very large. All of our breeds are dual-purpose, developed for both meat and egg production. We want both roosters and retired hens to be large enough for table use. If we were to select for early laying, our birds’ average sizes and weights would start to decrease in each successive generation, making these birds less “dual purpose” and less useful to our customers and to us. For this reason, we don’t select for earliness of lay. Instead, we select our breeders based on the breed standard and based on production traits.